You are likely to encounter a range of weather conditions on the TMB be it hot sun, pouring rain or even snow on the highest passes. You will also walk on well-maintained paths, occasional rocky sections and may even have to cross a stream. The range of conditions encountered on the 165km walk means you need the best walking boots you can afford. 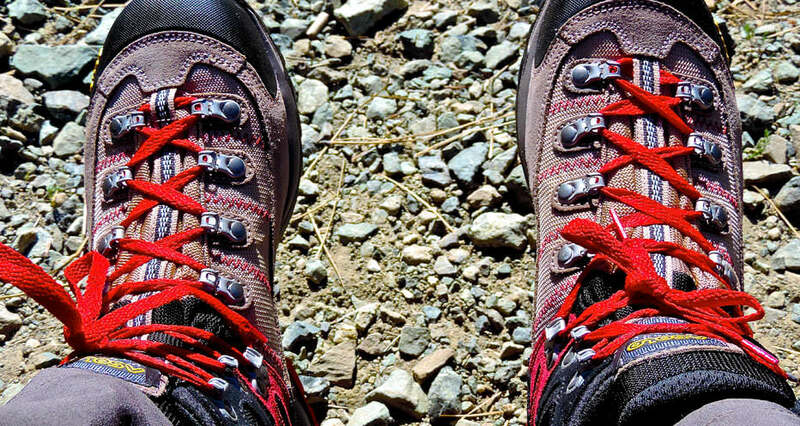 A 3-season summer trekking boot is best; you do not need 4-season winter boots. Most modern-day walking boots are very well made, don’t take long to wear in and will last you many years. Leather boots made prior to the 1990’s often needed many miles done before they were truly comfortable and even then people would bath their feet in white spirit just to harden their heels! You need a boot that fits well: it is an obvious thing to say, but it is worth trying a number of different brands and foot-widths before committing to buying a pair. If the shop doesn’t have boots that fit well, you need to go to another shop. Unless you absolutely have to, don’t put foot beds into the boot just to make it fit your foot. The boot should fit your foot without any need for foot soles, foot beds or heel lifts. Reputable brands include Scarpa, Meindl, Berghaus, Merrell and Salomon. There is no point in buying cheap boots – it is a false economy. They will not be good quality, will not last long and will cause you more problems. They are designed for the occasional, fair-weather walker. Even some of the ‘economy’ outdoor shops have their own brands, but these are generally poor quality and best avoided. All good boots need to have a solid sole with grip, such as Vibram and the lacing system needs to be simple to use. It is a good idea to carry gaiters in your rucsac so that if it is really wet, these will go some way to keeping your feet as dry as possible. Finally, before you head out to the Alps, make sure that you have worn your boots on long walking days. This will soften the boots and harden your feet, thus reducing the likelihood of blisters. Whether you choose leather or fabric is not particularly relevant, though leather boots seem to last longer. Some people say that fabric boots breathe more easily and so your feet may stay cooler, but I have never noticed any difference. However, one slight bit of smart marketing that manufacturers over-play the value of breathable and waterproof fabrics on boots, whilst failing to point out that you have a massive hole in the boot – namely where you put your foot in! No boot can be completely waterproof. Much like waterproof coats that are made of Gore-Tex, fabric boots made of the same or similar material seem to lose their waterproof qualities much quicker than a leather boot. Fabric boots used to be much softer and more comfortable than a leather equivalent, but in recent years the leather boots are also much more comfortable. In truth, I can no longer see the point of having a fabric boot if you are a serious trekker. The only downside to leather is that you need to occasionally treat it with wax or it will dry out and become cracked. Trekking shoes – also known as approach shoes – have been popular since the mid-1990s and some of them are very good. They are, however, just a shoe and do not the offer ankle support that is inherent in a boot. In addition, they are no use if it rains as they offer no protection. However, some people do wear them when doing the TMB and, as long as the weather is good and you do not have to cross any streams, they will fine. Trekking shoes are really only designed for fair-weather trekking in warm and dry conditions and, for this reason, I do not recommend them if you are doing the TMB. If you do want to take trekking shoes it is sensible to take a pair of good boots in your main luggage in case the weather turns nasty. Trekking shoes will be no use in heavy rain or snow. Trainers or any other kind of footwear are not recommended for the Tour du Mont Blanc.